Winter weather is causing traffic mayhem in many areas today, proving that not everyone's prepared for winter driving. Here are what Jalopnik readers suggest are the ten best ways to prepare for driving in the ice and show. How Do You Prepare For Winter Driving? Why it's important for safe driving: If you're lucky enough to have more than one vehicle to choose from, make sure you don't make a poor choice. Just having a big vehicle is not adequate as rear-wheel-drive pickups and SUVs can be horrendous beasts in slippery conditions, with or without sandbags in back. A car with proper snow tires is always the best choice but, failing that, a light vehicle with FWD tends to trump RWD and an AWD vehicle trumps both. Why it's important for safe driving: You will have to do things outside your car: scrape ice, clear the grille and headlights, push. The risk of frostbite may be mild, but the risk of annoying goddammit-my-hands-are-cold pain approaches certainty. Show your hands some love and get a pair of warm gloves to keep in the car. Suggested By: vdub_nut is already a hybrid. Runs on tacos AND beer! Why it's important for safe driving: When you cleaned out your car last spring, you picked up your ice scraper from somewhere behind the seat, said Nah, I don't need this, and put it in the back of the garage someplace. You now need it. Go find it. A frosted window is about as bad as a salt-covered window, a credit card is a crappy ice scraper, and trying to drive while peeking through a tiny hole in the frost is as dorky as it is dangerous. Why it's important for safe driving: All the washer fluid in the world won't do much if your wipers aren't pressing against the windshield correctly. If you've been driving through the rain this year and thinking, Yeah, I probably should get new wipers sometime soon, DO IT NOW. They're cheap and simple to install and you will appreciate them the second they become necessary. Why it's important for safe driving: Having the right quantity and dilution of antifreeze running through your engine can mean the difference between driving to work and planning an unanticipated engine swap when everything freezes and expands. It's also important for your motor's long-term health regardless of season, as anyone who ever owned a Triumph Stag can explain. If you're doing a fluid change, be careful when disposing of antifreeze; ethylene glycol is extremely poisonous, and its sweet smell and taste can be attractive to household pets. Also, if you want to have another cool garage gadget, get an antifreeze tester; it's that thing that looks like a turkey baster with a gauge. It's up there with a circuit tester on the you-should-have-this-and-don't scale. Air-cooled Porsche and VW people don't have to worry about this, but they do have to worry about other things. Like how to keep from freezing to death while driving. Why it's important for safe driving: Since you've already looked at your wipers and antifreeze, you might as well just go ahead and cover everything. Check fluids and filters and change as necessary. Some people switch to lighter oil for cold season. Make sure your brakes and tires aren't worn out. If anything is wrong, this is the time to fix it; cold conditions don't help anything, and rectifying a problem just becomes that much more unpleasant. Why it's important for safe driving: People in seriously snowy and cold climates swear by dedicated snow tires. They will turn okay winter cars into capable ones and make already-capable ones that much more unstoppable. It's not just about the blocky tread patterns; modern winter tires have as much science and research involved in their creation as top-shelf summer performance tires. Studs may be worth consideration in very icy areas; check local laws regarding that. Besides, it's just such a deep car-guy thing to have an extra set of tires in the garage. 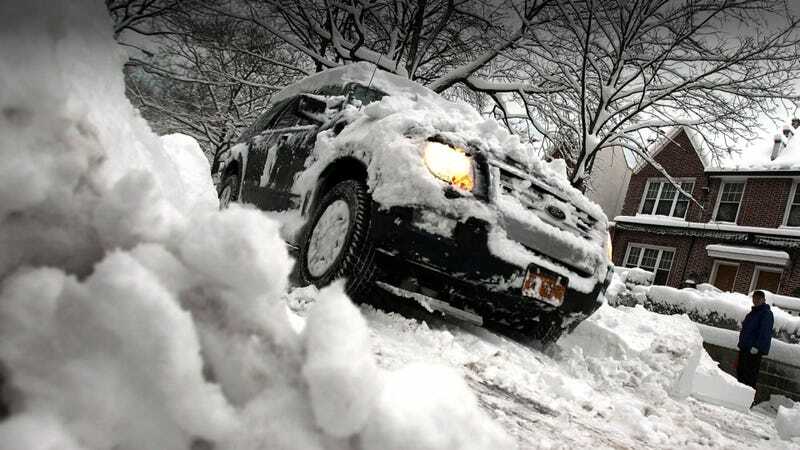 Why it's important for safe driving: Whether you have snows or normal all-season tires, keep them properly inflated. As we all learned during the Explorer/ Firestone fiasco, tire pressures are hugely important. When the temperature drops and as it fluctuates, your tire pressures change; make sure they're still where they should be. Check your tire pressures every so often to ensure you're not running unusually low. One soft tire might also indicate a bad bead seal if you've knocked a curb or something, which must be fixed promptly. Why it's important for safe driving: If you're going to be a good snow driver, you have to drive in snow. It is crucial to actually go out there in the slippery stuff to understand how a vehicle operates in low-grip conditions and how you must change your driving instincts (especially regarding braking distances) to adapt. Ready for the fun part? When the first mild snowfall occurs (more than a dusting, but hopefully not more than a few inches) head to an open lot – one without parking berms and light poles, please – and let your inner hoon meet your inner pragmatist. Practice accelerating, braking, turning, and do a little sliding. (Carefully.) You'll have a better sense of how your car feels, and you won't freak out when the car slips sideways a bit on an entrance ramp.